*This post was sponsored by Maverick Helicopters and The Cosmopolitan Las Vegas. 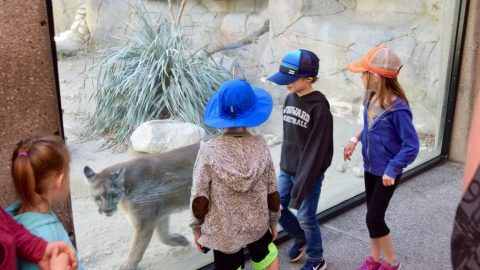 Our family is fortunate to have seen some amazing views from very high places, such as hot air balloons in Turkey and helicopter tours in Kauai. However, nothing tops my recent helicopter tour of the Grand Canyon from Las Vegas. It was a breathtaking experience, hosted by Maverick Helicopters for a group of us staying at The Cosmopolitan Las Vegas. As many times as we’ve been to Las Vegas, we never realized how close The Strip is to the Grand Canyon. These two places could not be more different from one another, and Maverick Helicopters helped us see both from new perspectives. The trip was about four hours of fun, with so many sights crammed into that time that I got lost in all the beauty. We boarded for our helicopter tour of the Grand Canyon from Las Vegas by boarding at McCarran International Airport. Opposite the regular passenger terminals sits a group of hangars, one of which is dedicated to Maverick Helicopters. 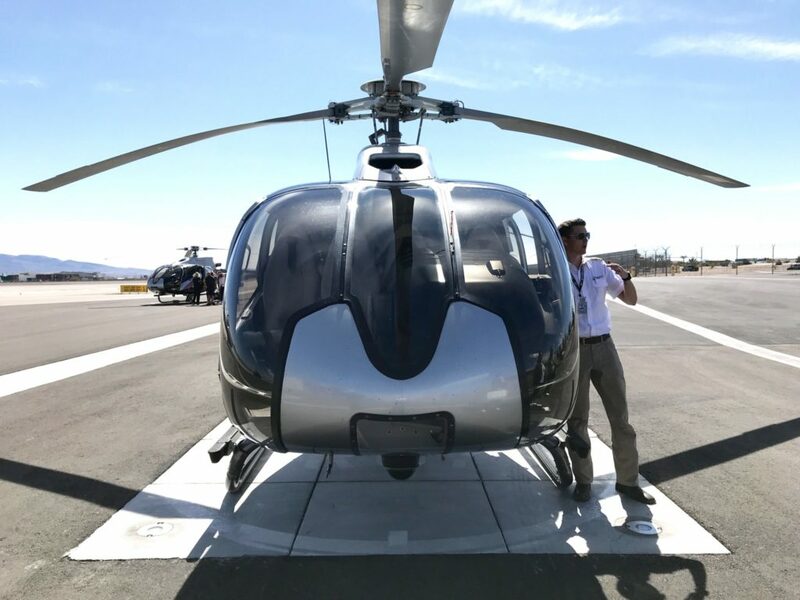 Flying a fleet of more than a dozen helicopters from this location, Maverick also has bases on the South Rim of the Grand Canyon, Maui and soon to open in Kauai. Our Maverick Helicopters pilot prepped us with a safety briefing before we boarded. It’s an easy shuttle ride from The Cosmopolitan to the Maverick hangar (they even come to pick you up at your hotel), where guests wait comfortably for a safety briefing and then boarding. With seating for seven passengers plus the pilot, the helicopter was surprisingly roomy. Surrounding by windows our sight lines were wide open, and as we ascended straight up into the sky, the Las Vegas Strip came into full view in all its glory. After a brief pass over the southern end of Las Vegas Boulevard, we headed straight out into the desert towards the Grand Canyon. Is this a doggie bag, or something else? Good thing we didn’t need it – the ride was smooth and easy. The ride was exhilarating. We dipped and soared across the the rooftops of East Las Vegas, low enough to see people in their backyards and yet high enough to see mountains on the horizon ahead. As we moved forward, our pilot took us on a wide turn in the sky that brought an amazing sight into view – one of the world’s most famous engineering achievements. Heading out towards the Grand Canyon, there were plenty of gorgeous vistas before we ever got there. We had a chance to visit the Hoover Dam last summer on our great road trip of the Southwest, but this view from high above was just mind blowing. 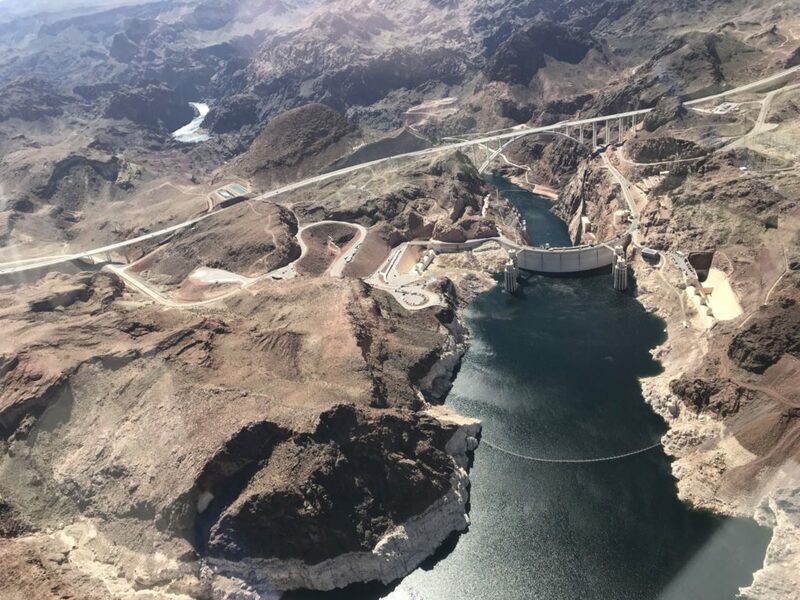 Our helicopter swooped around the canyon and approached the dam from the lower side, where the Colorado River flows out the bottom of the dam to continue on its’ way. Lake Mead sits above, blue and expansive, with Hoover Dam holding all that water firmly in place. Hoover Dam looks so impressive from above, with its fortress barrier and engineering marvels. As we soared above the dam, our pilot turned our vantage point to look south this time. Hovering over Lake Mead, we could see the top of the dam, the incredible drop to the river far below, and even little people standing on the top of the dam looking down. 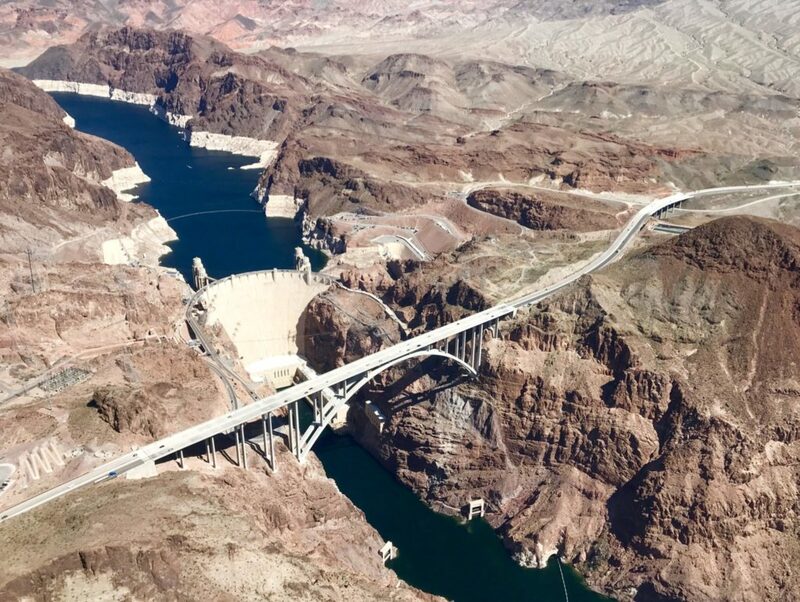 One of the most beautiful sights was of the Mike O’Callaghan–Pat Tillman Memorial Bridge, which spans the canyon with impressive arches in front of Hoover Dam. The photo opportunities were endless. Looking across Lake Mead from above, we could see Hoover Dam holding all the water with the Colorado River below. We powered on, reaching the crevices and deeply gouged earth of the Grand Canyon in just moments. The color of the earth changed color from dingy grey to a deep ochre red, with interesting variations in tone that are hard to notice close up. 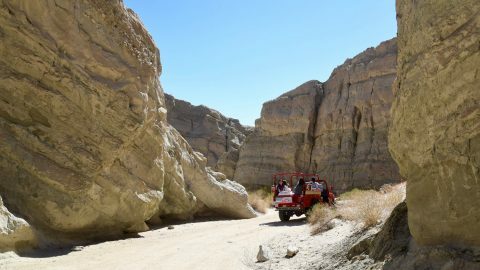 From high above, we viewed geological formations, striations in the canyon walls of color ranging from chalky white to blood red, and straggly plants trying for dear life to hang on to the steep walls. 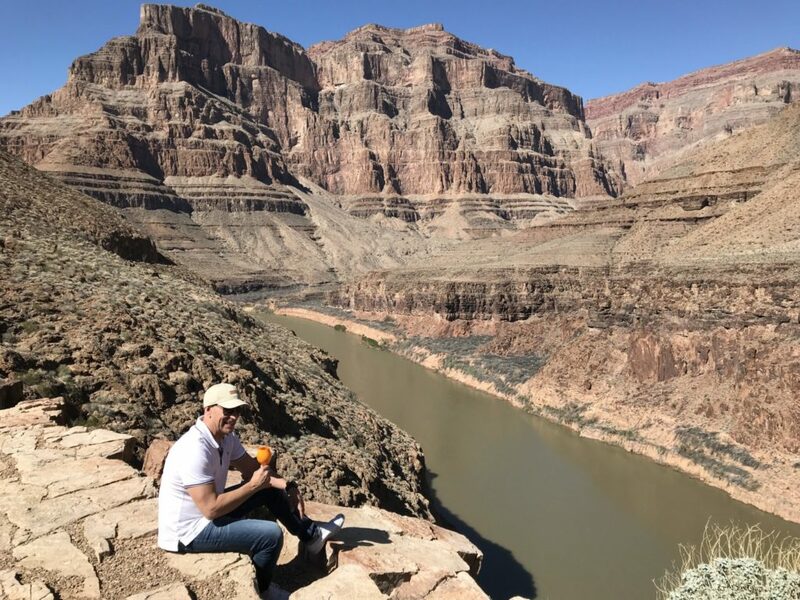 Sitting about 300 feet above the Colorado River, we were descended into the Grand Canyon and resting on an ancient plateau. Our pilot brought us down into the canyons, flying low over the Colorado River and between the high walls of rock on either side. It honestly felt like a video game, as we sped along with rocks whizzing by. All of sudden, we came upon a cliff-side clearing, where other helicopters were parked in an area inaccessible by foot or boat. As we touched down, the wind from the rotors whirled up a cloud of red dirt spraying up to greet us. Safely on the ground, we stepped out of the helicopter and were greeted by picnic benches, umbrellas, and delicious Veuve Clicquot cocktails whipped up by The Cosmopolitan’s chief mixologist Mariena Mercer. Mariena made us some killer Veuve cocktails, hanging out deep inside the Grand Canyon. Crazy cool! Sitting on a rock, sipping Veuve and looking out over the Colorado River, I couldn’t help but get a little emotional. After all, how many opportunities do you have to helicopter into the Grand Canyon and touch down on a cliff side to take in the view? Yeah, me neither. 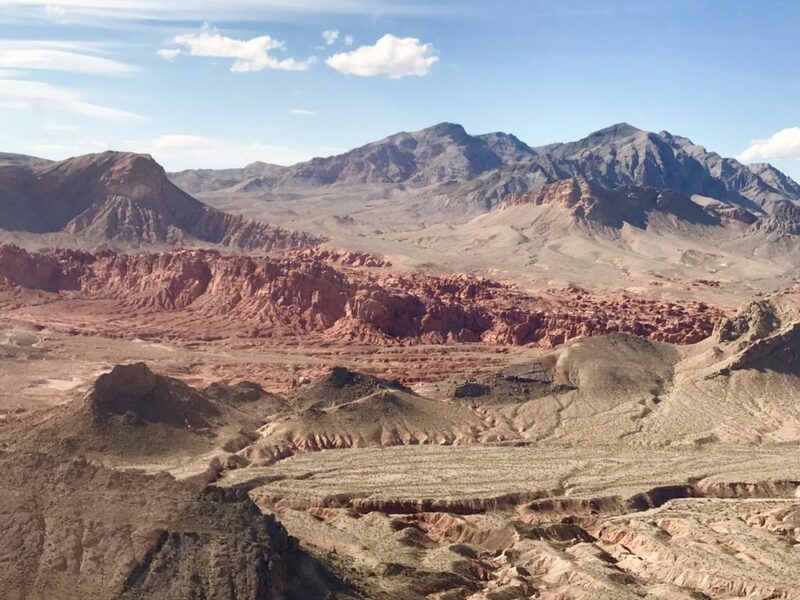 After the incredibly beauty of the Grand Canyon we were pretty quiet as we flew back towards Las Vegas, each passenger lost in our own thoughts. But we were delighted out of our reverie by the stunning view of the Las Vegas Strip on the horizon. Sure enough, the pilot maneuvered us directly along the Strip. 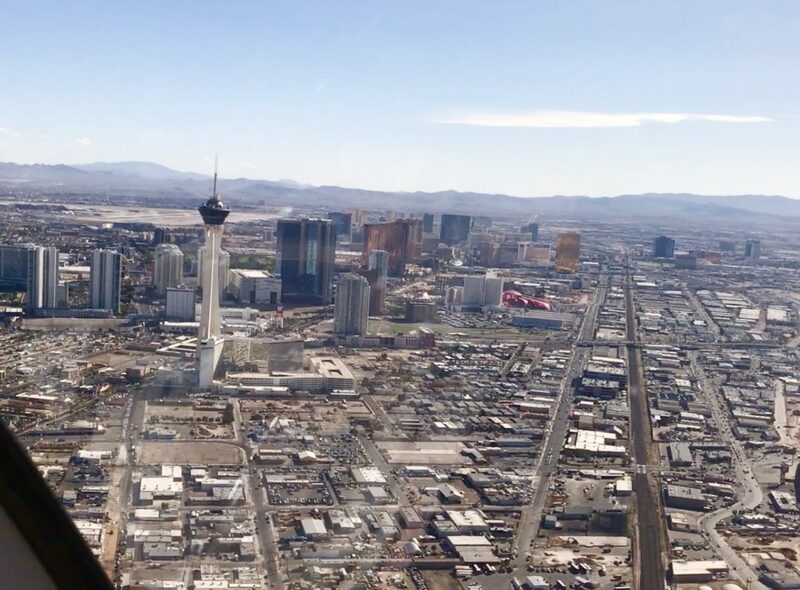 We flew over all the major icons of Las Vegas, including Fremont Street downtown, the Stratosphere, Caesars Palace, the fountains of the Bellagio, the tall towers of The Cosmopolitan, the pyramid of Luxor, and back to our starting point at the Maverick Helicopters hangar. Coming back into Las Vegas, we buzzed the Strip and flew directly over the hotels and casinos. Back at The Cosmopolitan, I was so charged up from our helicopter tour of the Grand Canyon from Las Vegas that I had to visit the spa for a massage. Luckily, the resort has an excellent spa called Sahra which was the perfect ending to an adventure filled day. I’d love to explore the Grand Canyon that way! Thank you for showing the helicopter perspective over the canyon and looking forward to doing it myself one day! The drink after that is compulsory!